These little cookie bites are the perfect accompaniment to our fresh Ontario strawberries! We keep a stock pile of berries in the fridge, so this cereal is loaded with organic blueberries, raspberries, and strawberries and topped with cookie bites. I’m already planning on topping my vanilla coconut ice cream with them later 🙂 Good thing I went to the gym this morning! I’m pretty sure the kids are going to ask for this cereal every single day from here on in. It’s delicious, and will destroy your favourite boxed cereal in both the quality and flavour departments. 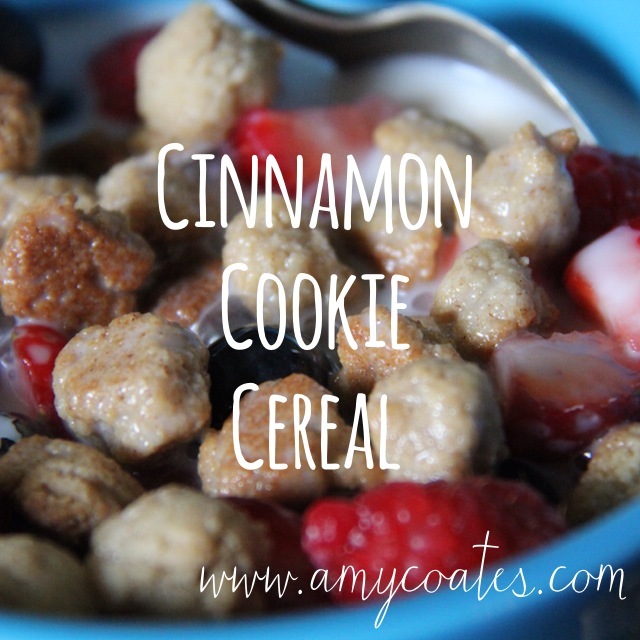 We top this cereal with unsweetened almond milk and it is perfect. There’s enough sugar in the berries and cereal that sugar in the milk would have been overkill. Although it may look like these took forever to make, I had half of the little balls formed before the oven had even heated up, so it’s not too bad. Totally worth it. In a bowl, mix almond flour, salt, cinnamon, and baking soda. Add melted coconut oil, maple syrup, and vanilla extract and mix well. Pull apart with your hands into little rustic balls. Hint: make a little dough snake and you can easily pull small cookie balls off the end. You can either grease the sheet with coconut oil, or use a silpat sheet – my personal favourite. Cook at 350° for 8 minutes. Let cookies cool on the pan and they will harden. Fill a bowl with your favourite berries, and top with cookie cereal and your favourite milk for a nutritious and energy sustaining breakfast.